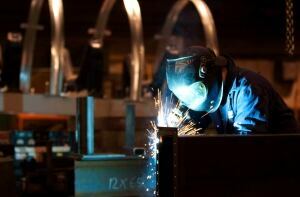 Manufacturing sales rose 1.7 per cent in December, Statistics Canada said Friday, despite a 9.3 per cent drop in sales of petroleum and coal products. If those two industries are excluded, Canadian manufacturing output was up by a very solid 3.2 per cent during the month, the data agency said. Part of the gain was attributed to stronger sales in the transport sector, including cars and automotive parts. Overall, sales were higher in 17 of 21 industries, representing nearly 80 per cent of total Canadian manufacturing. Sales increased in seven provinces in December, led by Ontario, Quebec and British Columbia. Sales were down by four per cent in Saskatchewan and 0.8 per cent in Alberta. The showing was a bit better than economists had been expecting, which could be good news moving forward, TD bank said in a note to clients. "Lower oil prices through the first half of this year will likely to continue to weigh on petroleum manufacturing," economist Dina Ignjatovic said. "Meanwhile, motor vehicle assembly manufacturing will likely lose some ground during the first half of this year, as the Chrysler assembly plant in Windsor is slated to shut down for retooling for 14 weeks as of Monday."